Sandboxing blocks malicious code. The App Sandbox in OS X helps ensure that apps do only what they’re intended to do. App sandboxing isolates apps from the critical system components of your Mac, your data, and your other apps. Even if an app is compromised by malicious software, sandboxing automatically blocks it to keep your computer and your information safe. OS X sandboxes apps like the Mac App Store, Messages, Calendar, Contacts, Dictionary, Font Book, Photo Booth, Quick Look Previews, Notes, Reminders, Game Center, Mail, and FaceTime. All third party apps that are distributed through the Mac App Store must be sandboxed (a requirement set by Apple) which means that they are prevented from accessing certain system resources and are prevented from writing-to or reading-from files or folders which the user has not explicitly granted it access to. X2Pro is distributed through the Mac App Store so it is bound by these sandbox rules and this sandboxing can mean that X2Pro users will have to perform a few extra steps in order to convert their fcpxml to an aaf. When the user opens an fcpxml in X2Pro or chooses a destination folder for the aaf, they are giving the application access to a file or folder that is outside its sandbox, but in order to process the fcpxml file, X2Pro also needs to be able to read all of the clip files that are used in the FCP X project (which are also all outside its sandbox). 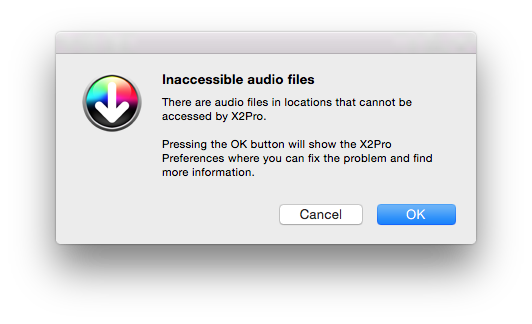 Sometimes there is a "bookmark" in the fcpxml that allows X2Pro to access these files without user intervention, but that isn't always the case. This is where the "Media Locations" feature of X2Pro comes in. The bottom part of the Media Locations window shows all the folders that contain clips that are used in the fcpxml, but that X2Pro doesn't yet have access to (Inaccessible Locations), and the top part shows all the folders that have already been added (Media Locations). You can add folders to the Media Locations list by pressing the "+" button then choosing a folder that contains clip files. If you have a standard installation it would be wise to start by adding your "Movies" folder to the list because this is the default location for FCP X's libraries. You can remove a folder from the Media Locations list (revoking the access that was previously granted) by highlighting it and then pressing the "-" button. When all the clip files are accessible by X2Pro the Inacessible Locations list will be empty and the text below the list will change from red (saying "Sandbox restrictions prevent X2Pro from accessing media in some locations") to green (saying "All media locations are accessible"). It is not possible to continue until all the clips files are accessible. 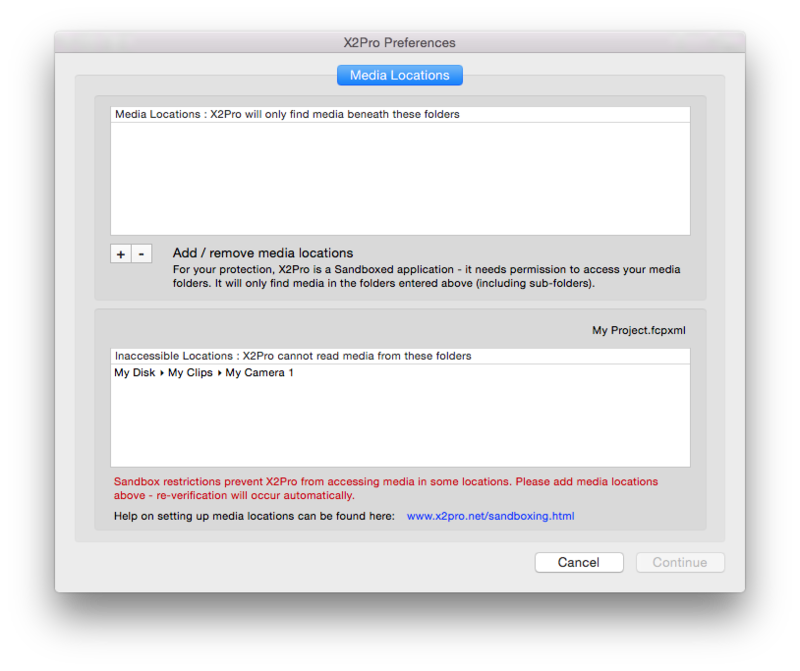 The "Media Locations" feature can also be accessed from the X2Pro preferences window and it is possible for a user to check for media location issues with an fcpxml without performing a convertion by clicking the "Verify against FCP XML" button and selecting the file. Users can add folders as Media Locations that are higher up the folder hierarchy than those listed. For example they could include their home folder rather than their movies folder and this would cover all files in Movies, Documents, Downloads, Desktop, etc. A few steps further would be to include the "root" of the file system (normally called "Macintosh HD"). Be aware that this would grant permission for X2Pro to access the whole file system, so effectively removes file sandboxing for X2Pro. As every file (even files on external, USB or networked drives) is mounted in a subdirectory of the main hard disk, the user will never need to add a new media location after this one.